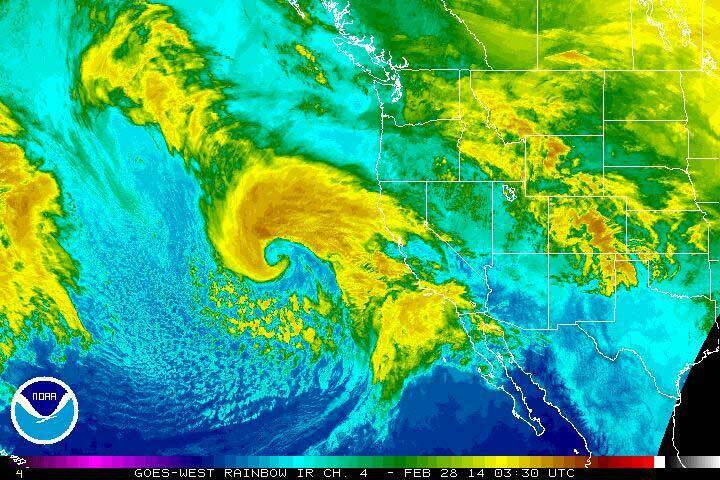 Should we be worried that California has yet to experience an epic deluge so far this fall? What happened to the ostensible “parade of storms” that is so often talked about in the context of major El Niño events? After four consecutive years characterized by a remarkable lack of storms in California at any time of year, it’s easy to forget that autumn is always capricious in California. Transitional seasons tend to be highly volatile throughout the Earth’s middle latitudes as polar and tropical air masses interact often. But California is unique in the sense that it lies near the southern margin of the Pacific jet stream, and is therefore quite susceptible to relatively subtle shifts in the storm track. California can experience major storminess during September-November with temporary shifts in the jet, but in general sustained wet periods are the exception rather than the rule. Since the eastward-flowing jet stream is fundamentally driven by the large temperature differences that exist between the warm equatorial region and cold polar region, its location, strength, and trajectory depend on the orientation and magnitude of temperature variations across the Earth’s surface. With the approach of winter, temperatures begin to cool and the region of maximum north-south temperature differential over the Pacific Ocean starts to shift southward. The net result: the jet stream’s typical latitude from December through March tends to be farther south — and closer to California — than during the autumn. The primary means by which El Niño affects California precipitation is by enhancing the low-latitude (subtropical) branch of the jet stream. The subtropical jet stream isn't always a totally distinct feature in the weather charts; it tends to be weaker and more discontinuous than its more robust northern cousin (the subpolar jet). But during major El Niño years, the subtropical jet over the northern Pacific Ocean tends to be stronger, better defined, and further to the south than it usual. Earlier this week ocean surface temperatures in the closely-watched Niño 3.4 region reached 3 degrees (Celsius) above average for the first time in recorded history. This weekly value exceeds the maximum weekly value recorded even during the so-called “super El Niño” events of 1982-1983 and 1997-1998. While El Niño impacts do not correlate directly with the magnitude of SST anomalies in any particular section of ocean (and we’re still a ways off from an all-time record 3-monthly peak), this is still a major geophysical milestone — and one that has significant implications for the coming winter in California. So, with that in mind, how does the upcoming winter look? In a word: wet. The latest dynamical model forecasts are calling for well above average precipitation throughout California during the January-March period, and the recent forecasts from the more frequently updated CFS model have shifted toward a wet December as well. These same models are suggesting a large-scale atmospheric pressure pattern that is strikingly similar to that which occurred during California’s wettest historical winters (including the 1982-1983 and 1997-1998 El Niño events). Heavy seasonal precipitation totals don’t always mean major flooding if there are substantial breaks between incoming storms. In fact, some of California’s most widespread and most damaging individual flood events did not occur during El Niño years. But in general, high seasonal totals mean that heavy storms are more likely to coincide with already wet/saturated soil conditions, and El Niño-induced increases in storm frequency make it more likely for several intense events to occur in rapid succession. Thus, flood (and mudslide) risk will likely be much greater this winter, and certainly will be higher than has been seen in the past five years. This year, though, another major shift is afoot in the Pacific. The eastern tropical part of the ocean basin is extremely warm due to El Niño, but oceanic warmth farther to the north has been even more pronounced in recent months. The unusually super-warm North Pacific has the potential to add extra moisture to the atmosphere this winter. While this more generalized warming is unlikely to affect the frequency of storms, it may well act to add “extra juice” to incoming systems this winter. When we consider this effect in combination with the likely increase in storm frequency due to El Niño, it’s clear the potential exists for a very active winter overall. Finally, it’s important to point out that the planet has experienced nearly 20 years’ worth of global warming since the last big El Niño event in 1997-1998, and nearly 35 years’ worth of warming since the 1982-1983 event before it. In general, this means that there’s more moisture over the world’s major ocean basins than there used to be — which can increase the potential intensity of precipitation when it does occur. But other more complex changes have occurred in the coupled ocean-ice-atmosphere system over the past four decades that are harder to quantify, and may have less obvious (and less predictable) impacts on overall Pacific climate. These influences could muddle the overall impact of El Niño in California in the future. Despite these added uncertainties, however, it appears quite likely that the present El Niño will exert a powerful (and likely dominant) influence upon California weather this coming winter. Yet—as California’s state government and water agencies have gone to great lengths to emphasize—even a very wet winter in California is unlikely to completely erase the profound effects of California’s multi-year drought. In many ways, the present situation resembles a conundrum that the Golden State is likely to face more often in the future: how to manage a greatly increased risk of extreme precipitation and flooding despite the presence of long-term water deficits. Daniel Swain is a climate scientist at Stanford University. A longer version of this post appears on the California Weather Blog, where you'll find all of his previous posts. Artist and naturalist Emily Underwood distilled several complex geophysical concepts into the scientific illustration for this post.